Figure 3.6 Variations in the average latitude of sunspots. Ejection of material from the surface of the Sun often follows solar flares or other solar phenomena. 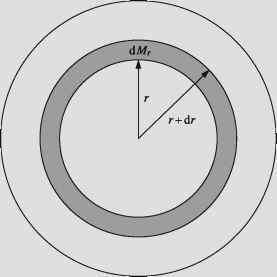 Sometimes this material reaches Earth and gets trapped in the magnetic field around Earth's polar regions. This material consists mostly of charged particles (ions and electrons), which interfere with communication systems and produce magnetic and ionospheric disturbances such as auroras. Another visible phenomenon of the photosphere associated with the Sun's magnetic field is the faculae. These are irregular patches or streaks brighter than the surrounding surface. They are clouds of incandescent gas in the upper regions of the photosphere. Such clouds often precede the appearance of sunspots. The chromosphere is the first layer of the Sun's atmosphere. It lies just above the photosphere and is a few thousand kilometres thick. During a solar eclipse, when the Moon passes in front of the Sun, the chromosphere appears as a red shell around the Sun. The chromosphere is much hotter than the photosphere, ranging from 4200°C near the surface to 8200°C higher up. It consists largely of hydrogen, helium and calcium. The corona is the upper layer of the Sun's atmosphere. During a solar eclipse, it appears as a pale white glowing area around the Sun. Temperatures in the corona reach as high as one million degrees Celsius because of interactions between gases and the photosphere's strong magnetic fields. The corona can extend millions of kilometres into space. The corona consists mainly of ionised gas or plasma. burning gas ejected upwards from the photosphere and suspended in the Sun's magnetic field. 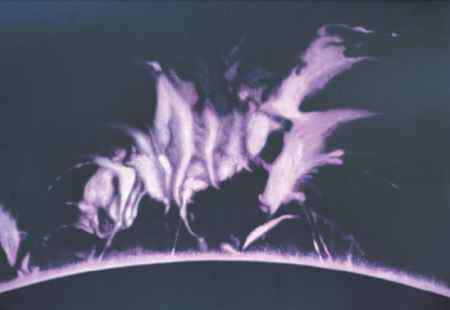 When viewed side on (such as at the edge of the Sun), these eruptions, called prominences, can be seen as gigantic loops or arches. Temperatures in the prominences can reach 50 000°C. Some prominences last for only a few hours, while others last for weeks. Prominences can only be seen in hydrogen-alpha light using special telescopes or during a total eclipse. Solar flares occur when the magnetic field of the Sun changes rapidly to create an explosion of charged particles through the Sun's corona. Such events last from a few minutes to a few hours and can send charged particles, X-rays, ultraviolet rays and radio waves into space. Flares can release energy equivalent to more than a billion one-megaton thermonuclear explosions in a few seconds. They are sometimes so violent that they cause additional ionisation in the Earth's ionosphere and may disrupt radio communications. The solar wind is an erratic flow of highly ionised gas particles that are ejected into space from the Sun's upper atmosphere. The wind produces a huge bubble in space called the heliosphere. This wind has large effects on the tails of comets and even has measurable effects on the trajectories of spacecraft. The Ulysses space probe is providing the first-ever three-dimensional map of the heliosphere from the equator to the poles. Instruments on board the Ulysses space probe have found that the solar wind blows faster around the Sun's poles (750 km/s) than in equatorial regions (350 km/s). 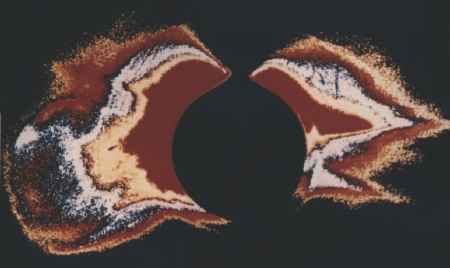 The SOHO space probe found that the solar wind originated from honeycomb-shaped magnetic fields surrounding large bubbling cells near the Sun's poles. Near Earth, the particles in the solar wind move at speeds of about 400 kilometres per second. These particles often get trapped in Earth's magnetic field, especially around the poles, and produce auroras. A coronal hole is a large region in the corona that is less dense and is cooler than its surrounds. Such holes may appear at any time during a solar cycle but they are most common during the declining phase of the cycle. Coronal holes allow denser and faster 'gusts' of the solar wind to escape the Sun. They are sources of many disturbances in Earth's ionosphere and magnetic field. While most of the Sun's activity follows the 11-year sunspot cycle, conditions in the heliosphere are driven by a 22-year magnetic cycle. The Sun's magnetic field is like that of a giant bar magnet with a north and south pole. Data from the Ulysses space probe showed that during the 2001 solar maximum, the Sun's north and south poles changed places. Ulysses next passed over the Sun's poles during the period of the 2007-08 solar minimum. At this time the Sun's magnetic polarity was opposite to that of the previous solar minimum. The magnetic field of the Sun influences the way in which charged particles move through the heliosphere.